The drone clipped razor wire, causing it to crash. A drone carrying drugs, a cell phone, hacksaw blades and other contraband was discovered crashed in an Oklahoma prison yard on Monday morning. Officers patrolling the Oklahoma State Penitentiary in McAlester noticed the drone lying upside down inside prison grounds at about 9 a.m. having apparently crashed after hitting razor wire that guarded the facility. 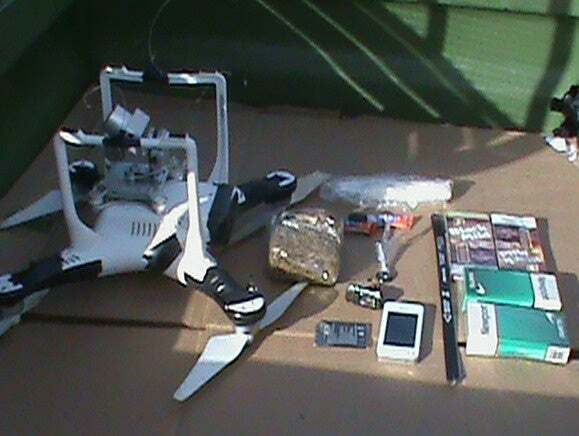 Upon investigation, they found a package of illicit material had been suspended from the drone by fishing line. 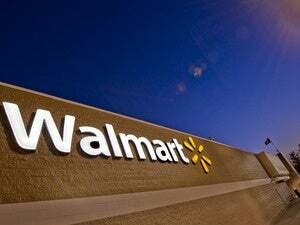 It included two 12-inch hacksaw blades, a cellphone, a cellphone battery, a hands-free device, two packages of cigarettes, two packages of cigars, two tubes of super glue, a bag containing 5.3 ounces of marijuana, a bag with 0.8 ounces of methamphetamine and a bag containing less than 1 gram of heroin. The Oklahoma Department of Corrections issued a photo of the drone, which resembles a DJI Phantom quadcopter. Alongside it in the picture were the goods it was carrying. The incident, which is the first reported case of its kind in the state, is now under investigation. 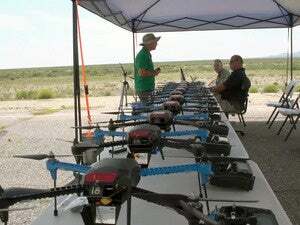 Drones have been used to attempt to smuggle goods and contraband into prisons in other U.S. states.